Hello my friends! 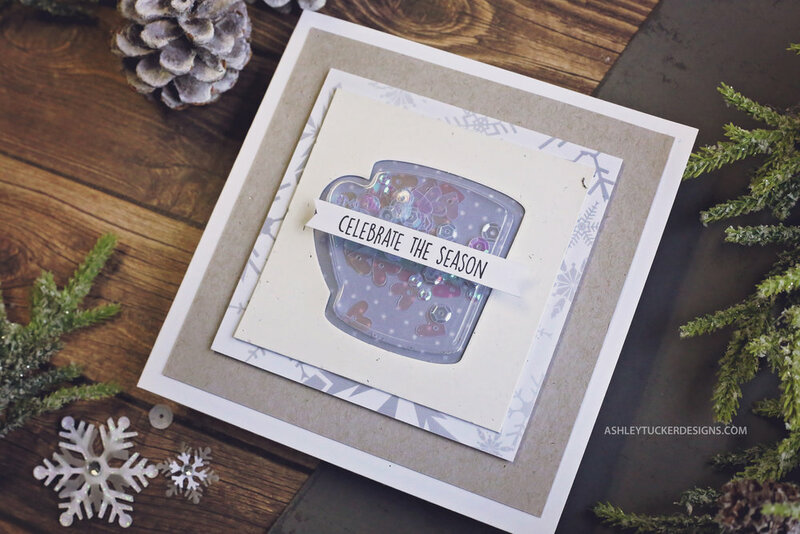 Today I am sharing some cards I created using the Flavor of the Month kit from Scrapping For Less. Be sure to check out the video to see the unboxing as well as how I made one of the cards below. The Flavor of the Month kit comes with 4 mini collections inside of it. Each collection contains a bunch of products which were thoughtfully picked out to go together to make beautiful cards. The kit also inclues 8 pieces of 8.5 x 11 cardstock in various colors. There is an upgraded version of the kit called the “Banana Split” which adds on even more goodies. 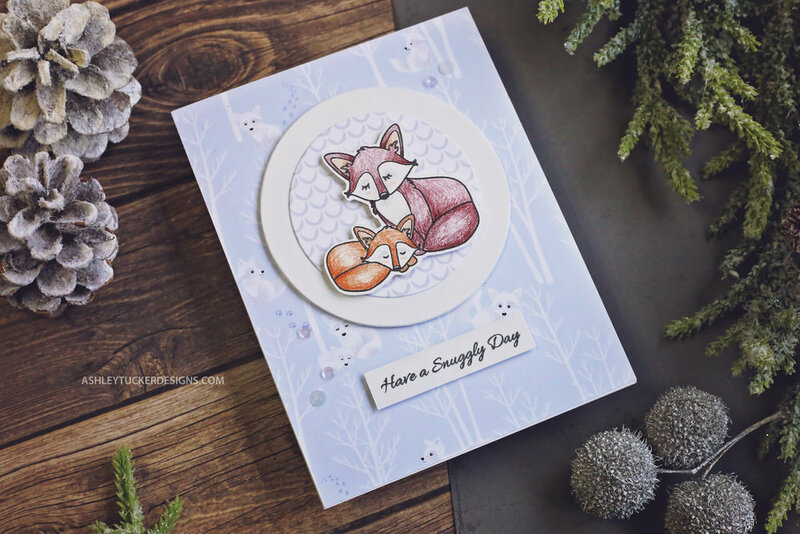 I created one card from each collection to share with you today! I colored in the bear on this card with colored pencils. I embossed the sentiment with gold embossing powder and popped it up with foam tape. I used one of the gorgeous patterned papers for the background. I used the fun mug shaker element that came in this collection. It was easy to use and the sequins from the collection looked great in it! You can see how I created this card in the video above! I love the way this one turned out. 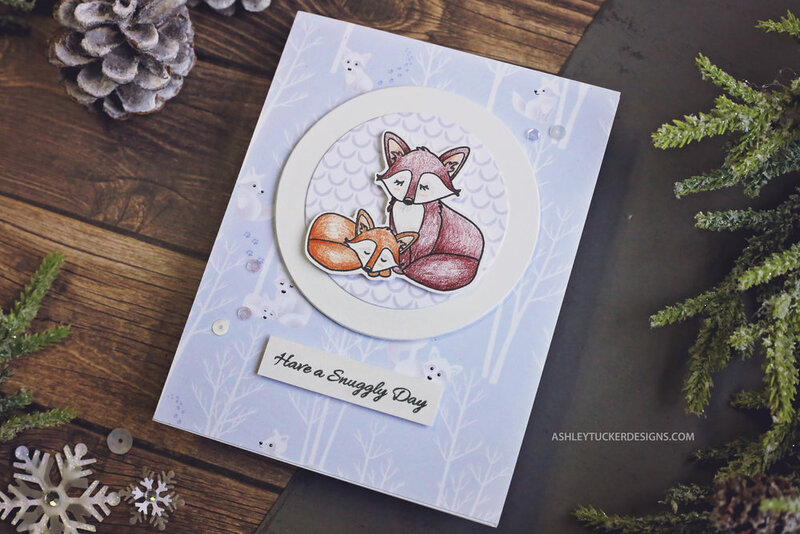 I absolutely adore the patterned paper that I used on this card. This collection had some really cool paper. I colored in the foxes with colored pencils and the sentiment that I used came from the stamp set in the Banana Split extras. Thanks for stopping by with my today! I hope you enjoyed these card designs! Hey friends! 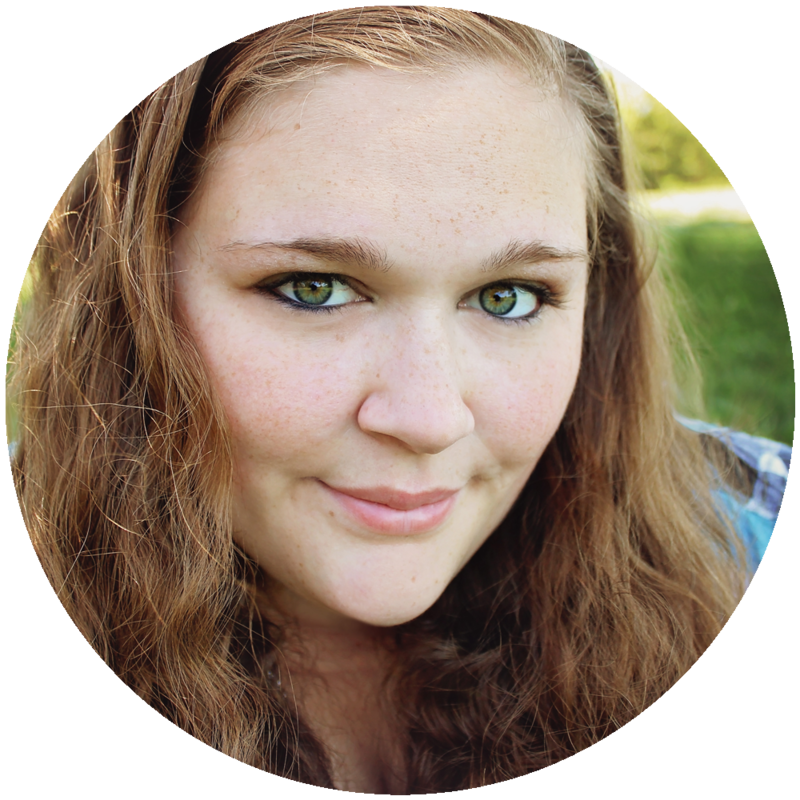 I have a one last Christmas card to share with you all today for the Brutus Monroe blog hop! For this card I used the stamp set that came in Brutus Monroe’s stamp of the month club. The stamp is intended to be a light bulb but when I was looking at it it reminded me of ornaments that I have seen created with the old chunky Christmas lights. So I did a little stamp surgery and cut the wire off the stamp (I can easily put it back together for future cards) and I used that to do my stamping. So I stamped with bulb onto some vellum (which I had treated with a powder tool) with an embossing ink and then embossed them with Alabaster embossing powder. Next I took the Snow Friends stamp set and pulled out the snowflake stamps and arranged them on each of the bulbs. I stamped the snowflakes with embossing ink and used Gilded Sparkle embossing powder. Before setting the powder with my heat tool I took a paintbrush and brushed away any stamping that went outside the bulbs. I fussy cut the bulbs out with scissors and moved on to the background. For the background I started with a really dark gray piece of cardstock cut to 3.5 x 8.5. I prepped it with a powder tool and took out my Snowflake stencil. I added a few of the snowflakes from the stencil to the edges of the cardstock by pressing my embossing ink into the stencil. I embossed them with Icicle embossing powder. Using a blending tool I blended Raven Detail ink along the edges of the paper and Alabaster white pigment ink in the center, creating a spotlight effect. The final touch for the background was splattering some Pearl Aqua Pigment ink for a snowy effect. I used foam tape to pop up my bulb ornaments on the card. I used some silvery twine for the strings, adhering them under the foam tape on the bulbs. I used a silver paint marker on the top of the ornaments and also glued a little bow on each. I popped the panel up onto a 4 x 9 white cardstock base. For the sentiment I heat embossed the “Merry & Bright” from the lightbulb set onto some with cardstock with Gilded embossing powder. I popped that up on the side of the card. Finally I went over the ornaments with Wink of Stella glitter. Hey friends! 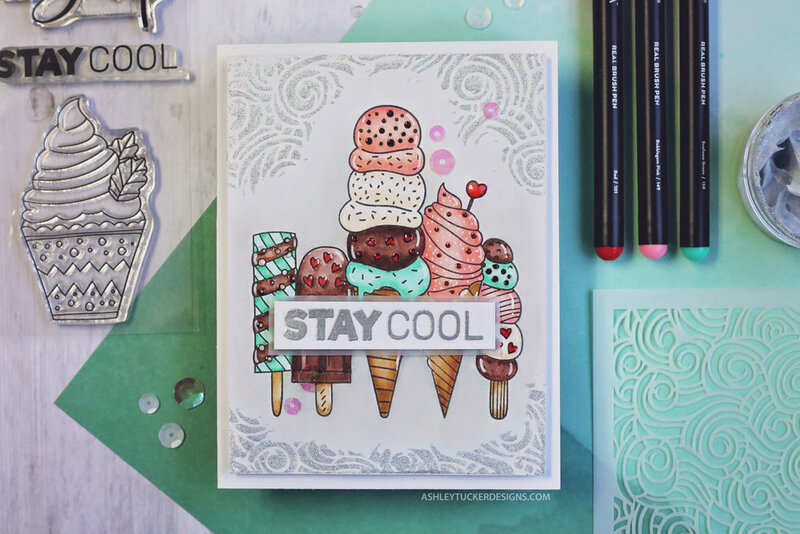 I have a really “cool" (sorry I couldn’t help myself) card to share with you all today! 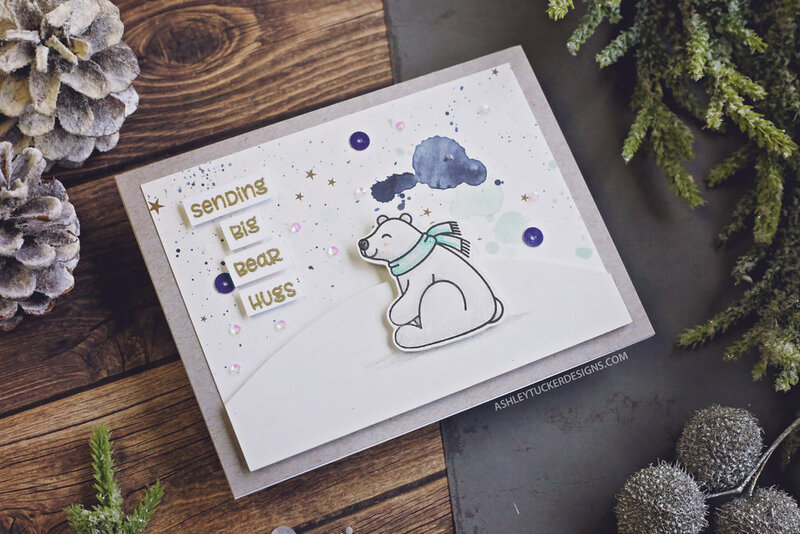 For this card I used the Sprinkled with Love stamp set from Brutus Monroe. I stamped three of the ice creams from the set onto some masking paper and cut them out with my Scan N Cut. 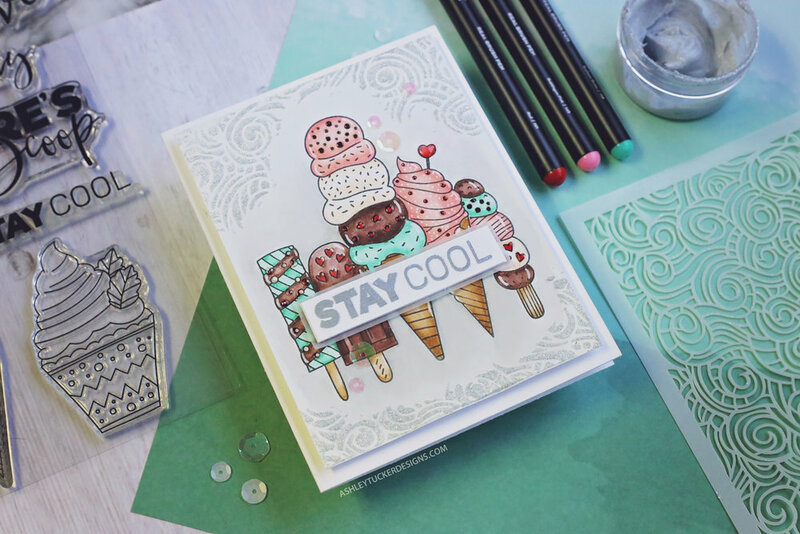 Next I stamped a group of ice cream cones together on some Alabaster white cardstock using my MISTI tool. I stamped them with Raven Detail ink. In order to get them all together, with some in front of others, I used the masks that I cut out. I colored in the ice cream cones with Arteza watercolor markers. To make them a little bit more detailed I added some highlights with a white gel pen. I also went over some of the elements with Glossy Accents. To dress up the background a little bit I pulled out the Tangled Waves stencil. I added a little bit of Unicorn Glitter Glaze over the stencil onto the edges of the paper. Once that was dry I popped up the panel onto a white card base with some foam tape. 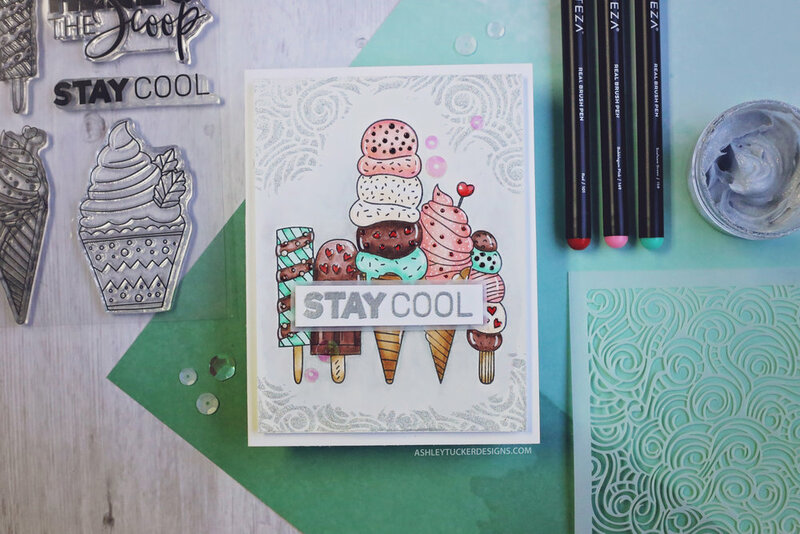 For the sentiment I stamped the “stay cool” sentiment from the set onto a piece of Alabaster cardstock. Before stamping I prepped the paper with a powder tool and then stamped with embossing ink. 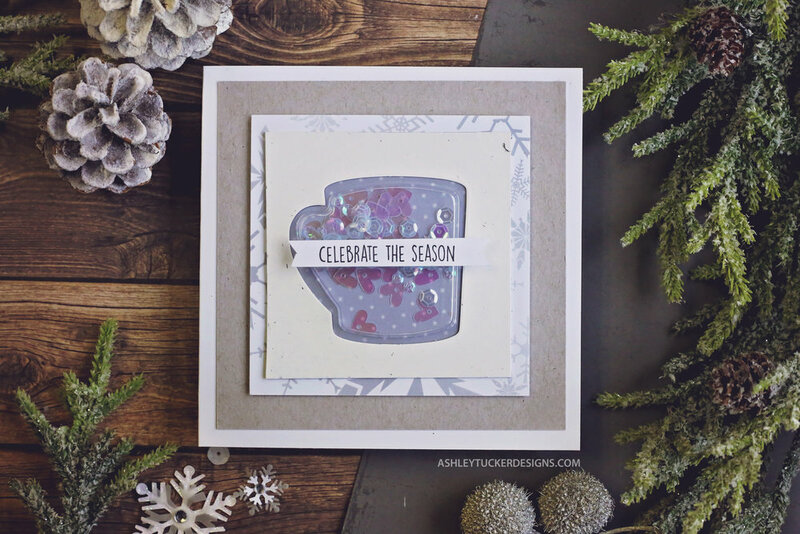 I embossed the sentiment with Sterling embossing powder. After gluing the sentiment strip to a slightly larger piece of vellum I popped it up onto the card. 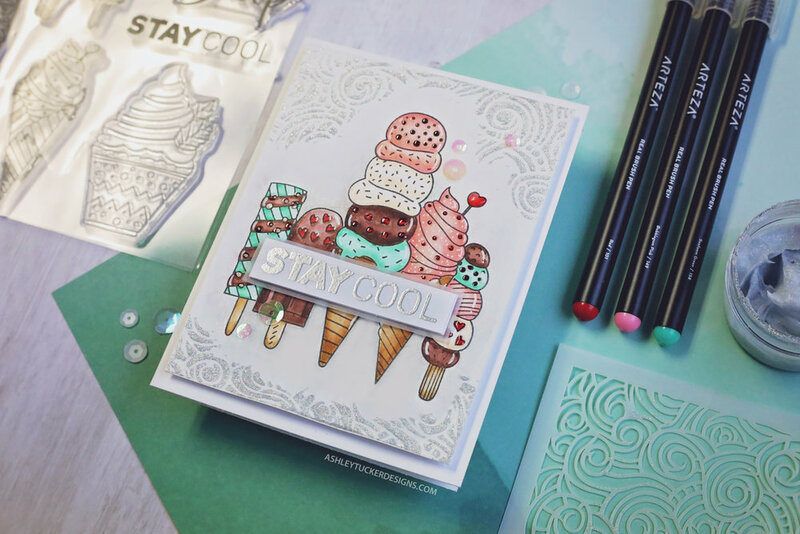 To finish the card up I added some sequins and some Wink of Stella around the ice cream. Hello everyone! 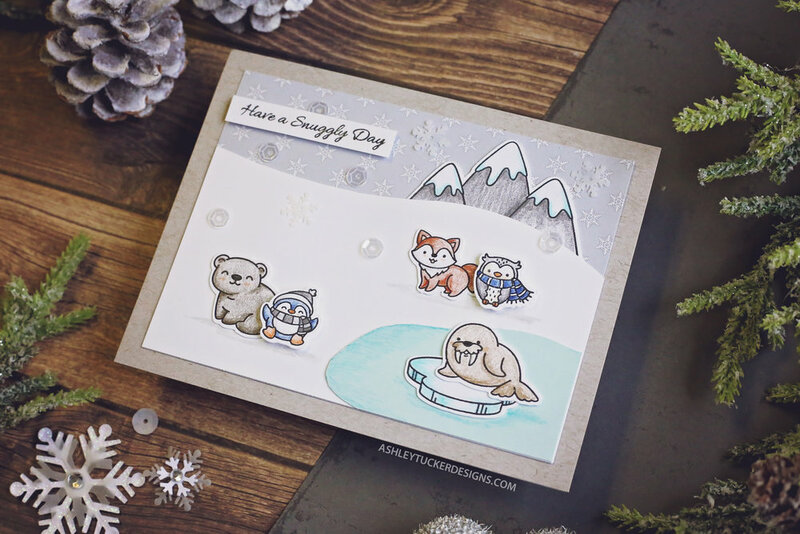 Today I have a quick and simple card design to share featuring some products from Brutus Monroe. I created this card for the Brutus Monroe blog hop. For today’s hop we all were challenged to create something using a specific color palette. So the first thing I did was try to find cardstock in my stash that matched each color in the palette. Once I had a scrap of cardstock in each color I tried to thing of a Christmas word that I could cut out with the colors. There are five colors in the color scheme, so I picked the work Merry. I used the Square Alphabet Die set to cut one letter out of each color. I cut very tiny pieces of foam tape in order to pop up each of my letters. I used a T-square ruler to help me place to letters onto a white card base. I like to place the first letter and the last letter first and then the middle letters. This just helps me get the spacing between the letters more even. 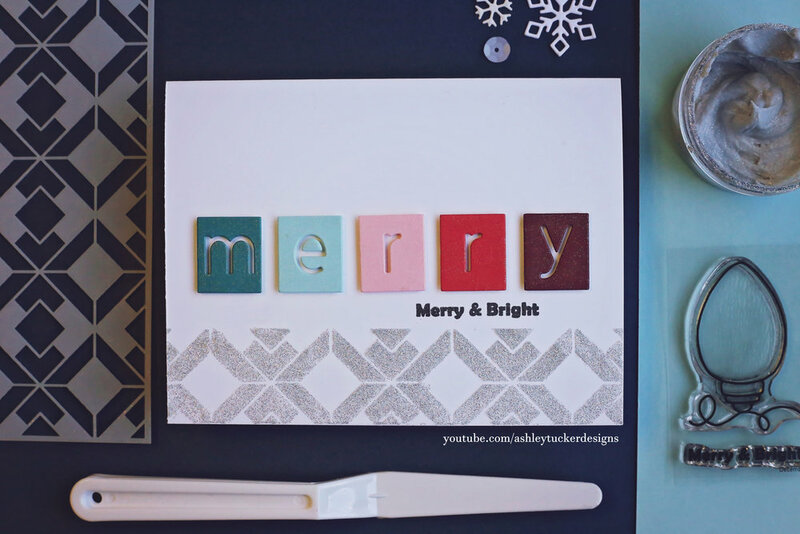 I popped my card base into my MISTI and picked out a sentiment to stamp under the word “merry.” I chose a stamp from the new Brutus Monroe stamp of the month stamp set which says “Merry & Bright.” I stamped that using Raven Detail ink. Next I pulled out the stencil from November’s stencil of the month club. I taped it down over the very bottom of the card, right under the sentiment. I added some Unicorn glitter paste very carefully over the stencil. I smoothed it out as best as I could and then lifted the stencil up. The last thing that I did to finish the card was take my Wink of Stella glitter brush and go over the square letters to make them all sparkly. I am having a giveaway to celebrate reaching 5000 subscribers on my YouTube channel. 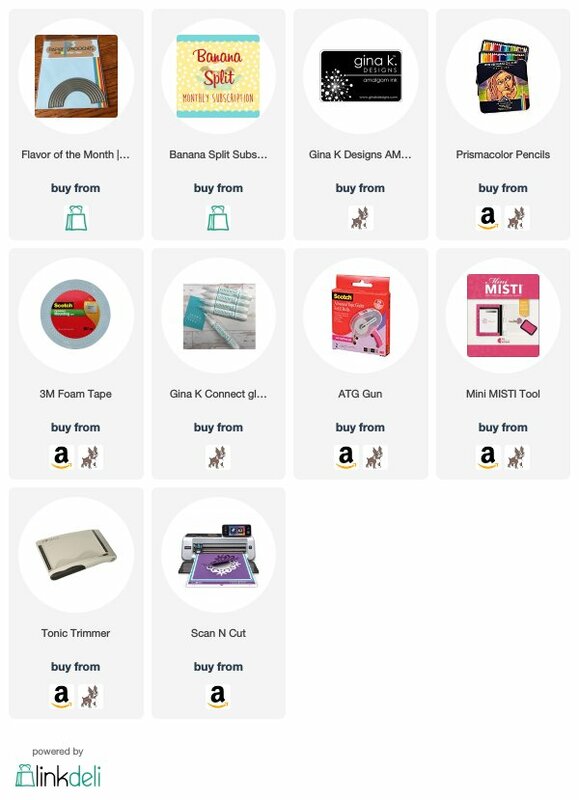 Click the link to go check out the details and enter! Hey everyone! I wanted to share with you this shaker card I created using some little shrink film snowmen. To create the snowmen I used some Brutus Monroe shrink film. It is a very interesting product. 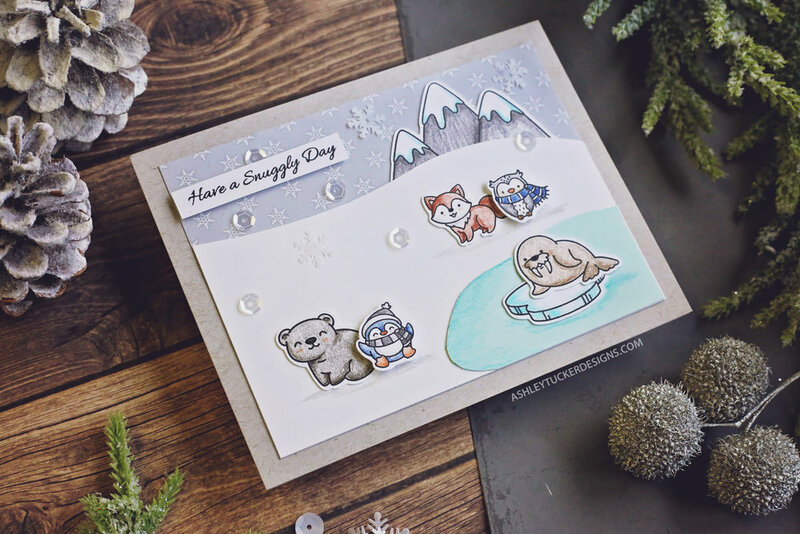 The stamp set that I used is the Snow Friends stamp set. I stamped the snowmen on the shrink film with Raven Detail Ink and then fussy cut them out. The ink stays wet on the shrink film until heated so you need to be careful not to smudge the stamping while fussy cutting. Once cut out, I heated up each snowman with my heat tool. Not only does this set the ink, it also shrinks the shrink film down creating this cute little plastic snowman charm. It is a really great technique for making jewelry, but today I am making a card with it! Once I had my three snowman all shrunk down I colored them in with Copic markers. I found that I got better results doing the coloring after shrinking, though it could work before with other mediums. Before creating my shaker I wanted to stamp my sentiment. I used a stamp from the Brutus Monroe stamp set Jingle All The Way. I stamped it with an embossing ink onto and A2 size piece of white cardstock. I embossed it with Gilded embossing powder which is my favorite gold embossing powder. To make my shaker I took the panel with my sentiment and cut three square windows along with top with a die. I glued a piece of acetate to the back of the windows with my ATG gun. For the background of my shaker I painted a piece of watercolor paper with Frosted Cranberry Aqua Pigment paint. This is one of the metallic Aqua Pigment paints so the background is nice and sparkly. I added foam tape around each of my three shaker windows and placed my shaker pieces inside. I used some red half pearls for the shaker pieces. I took the red background I created and closed up my shaker areas. Next I took the whole shaker panel and glued it to a card base. To finish up the card, I took the three shrink film snowmen and glued them onto the shaker windows. I found that they stuck really well using my ATG gun for the adhesive.